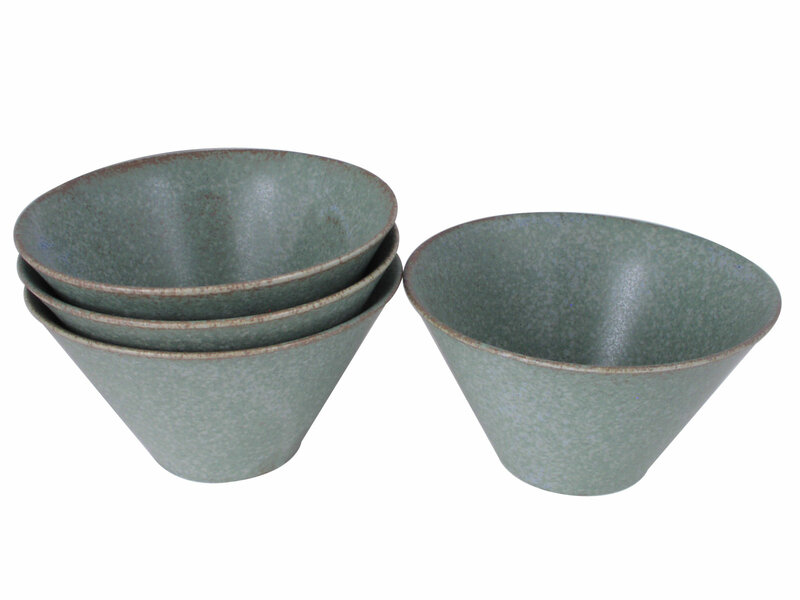 Made in Japan, this ceramic cereal bowl set is part of the Moss Green collection and comes with four beautiful matching Japanese cereal bowl that are perfect for enjoying your favorite cereal, salads, or even desserts in. In a lovely shade of a pale green and speckled brown, this Japanese cereal bowl set has colors similar to Spanish moss trees. As each bowl is individually handmade and colored, no two bowls will ever have the exact same blotches of color on the bowl, making each of these Asian bowls as unique as plants or moss in nature itself. With a unique tall shape, this Japanese cereal bowl has a paper like smooth texture all throughout the bowl. Get creative with serving your guests different kinds of meals with this interesting bowl and take advantage of its tall shape to put bananas in cereal, cookie biscuits in ice cream, or use as a serving bowl. Packaged in a paper box, this Japanese cereal bowl set makes a great housewarming gift as well.